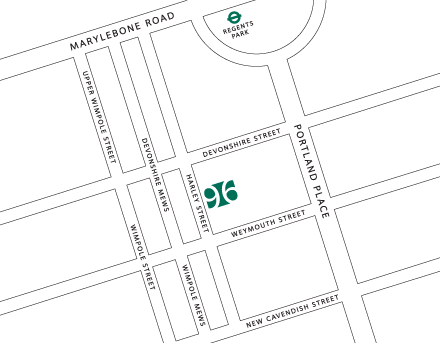 Short-term meter parking is available in the streets surrounding Harley Street, with a maximum 4 hour stay. For longer-term car parking, there are parking stations in nearby Cavendish Square, Queen Anne Street, Weymouth Mews and Moxon Street. Please note that Harley Street lies within the congestion charge zone (click here to visit the congestion charge website). Parking meters are also available in the area adjacent to Regents Park, which is close to the practice and outside the congestion charge zone. The nearest tube stations are Regents Park (Bakerloo line), Great Portland Street (Circle, Hammersmith & City and Metropolitan lines) Baker Street (Jubilee, Bakerloo, Circle, Hammersmith & City and Metropolitan lines) and Bond Street (Central and Jubilee lines). Bus numbers 18, 27, 30 and 205 stop at Marylebone Road, at the northern end of Harley Street. To plan your journey, please visit the Transport for London Journey Planner and/or call 020 7486 0506 to confirm directions.